A southern storm gridlocked Atlanta Tuesday afternoon and continues with closings and torturous conditions across the metro area and beyond. Snow, ice and brutal cold caused motorists to be stranded on freeways and left children and teachers to sleep overnight at their school. 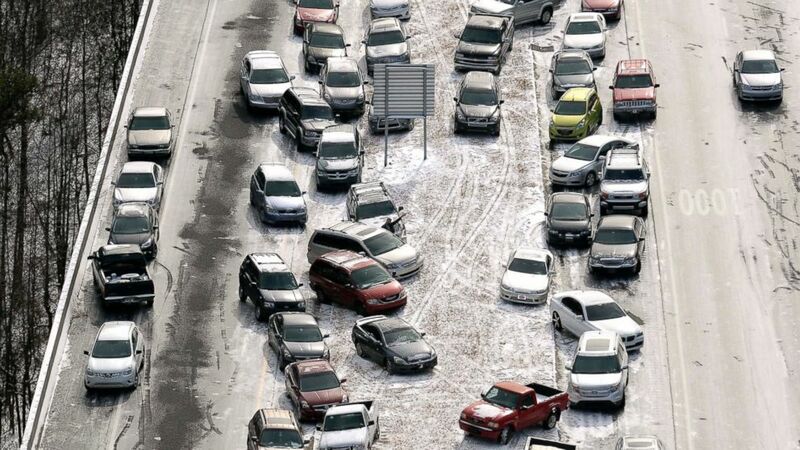 Thousands of stranded vehicles coupled with icy roads and accidents after a mass exodus from the city, along with cancelled flights were all a part of the disaster that hit Atlanta January 28, 2014. 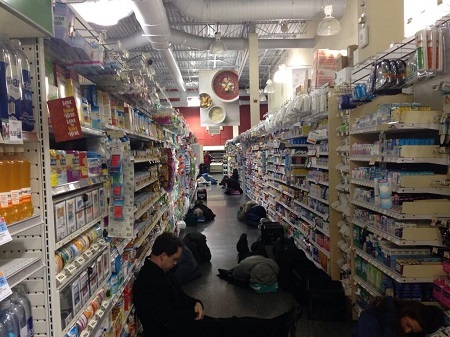 People were left sleeping in the isles at Publix after being stranded by this winter storm. I-75 was a parking lot near the Chattahoochee River, when the South became paralyzed rather quickly. Wednesday morning, Governor Nathan Deal had deployed The National Guard, with their Humvees, onto the freeways in Atlanta. Food and water were needed when people were stranded in their cars for more than 14 hours. Water was being handed out to thousands of stranded motorists on I-285 near Dunwoody, Georgia, and other areas. A car was seen on fire after being abandoned by its owner on a frozen road. “Spaghetti Junction” as it’s called by locals, was abandoned as seen by aerial view. Only icy roads or white out lanes were seen. A five car crash was seen near Johnson Ferry in Sandy Springs. Atlanta was unprepared for this citywide and beyond winter storm disaster. The city was still recovering from the gridlock as temperatures were not going to be above freezing on Wednesday. Freezing rain and snow appeared in Savannah, Georgia, which covered the beautiful pink camellias in Forsyth Park, near the historic section of the city. Teachers and students spent the night in schools when buses were unable to bring them home or their parents became stranded in efforts to pick them up. Kasim Reed, Atlanta’s mayor, responded to the disaster defending their part, saying their were no fatalities. The problem he identified was everyone left at the same time. The city left as soon as the snow hit. It only took two inches of snow to paralyze the city, stranding motorists overnight, while others abandoned their vehicles and walked home in the icy frigid conditions. The city has 30 spreaders and 40 snow plows, which had pretreated the roads Tuesday morning by crews, that began working around the clock in twelve hour shifts. This is the first time the city has had help from these snowplows and crews. Previous winter storms like in January 2011 the city shut down 2-3 days. The mayor assured parents the kids were safe in schools and ushered words in effect of ‘do not go to get them, stay off the roads.’ Additionally, firefighters stepped into assist the stranded folks. Almost 800 accidents have been reported with injuries in 14 of them. Stories are emerging of kindness and rescues. Georgia’s Governor, Nathan Deal, also said State troopers went to schools to assist with children stuck there overnight, after the massive but quick storm that hit Atlanta and other southern cities. Helicopters were dispatched to search for stranded drivers, amidst the affected parking-lot style freeways. Hijacked tractor-trailers blocked equipment from treating the icy roads. Reports say at least six people died in accidents due to the winter storm across the south. Four lives were lost in a mobile home fire in Mississippi from a space heater. Some folks only had to go home 12 miles, yet their car would go ahead five feet and stop for another two hours. This went on and on for hours into the night. Some slept at Publix or walked home leaving their car. Southern graciousness amidst strangers helped a lot. Waitresses at the Waffle Houses kept their cool, witnessing the kindness emitted from total strangers. People assisted others in moving cars to get off the roads. Even bosses slept at the office in a downtown hospital. And of course, a hero is born when police assisted with a birth on an interstate, which was gridlocked late Tuesday afternoon. This southern storm gridlocked Atlanta and continues to shut down the city into Wednesday. Temperatures are expected to rise by the weekend, considerably, which may be the final help in this disaster.